coldest temps for years, no fan gun ? Discussion in 'Lake Mountain' started by Hunter, Jun 21, 2013. 1. Has the fan gun they had gone / dead or moved elsewhere ? - running in full view of the cam ? It's certainly been running, just not in the toboggan run cam area. I spoke with someone on the mountain this morning. It was running all night, and it was running at least until 9am yesterday. Main run now has a pretty reasonsable cover. 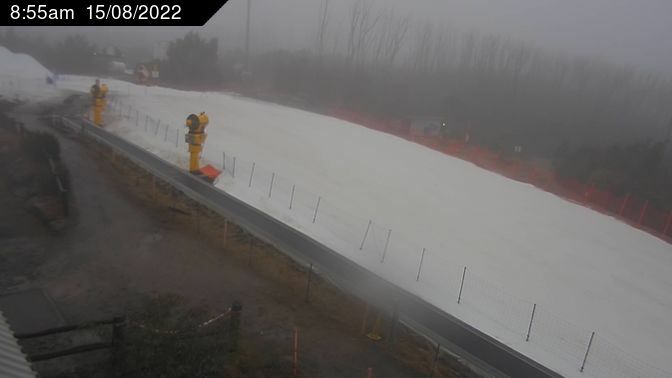 They're preparing the second toboggan run (Koala Creek) for opening for the weekend, so a lot of their snow making efforts are happening there. Next week, they'll be concentrating on making snow for the Sprint X ski race to be held in 8? days time. When that race is over they'll move that snow to the beginner ski school area and into the snow play area for the school holidays. I doubt the mountain has ever made as much snow as they've made in the last few days. Maybe it is just me but the resorts biggest marketing tool bar none is that cam view of the tobaggan run, the slug piles are a great start but do whatever it takes to get a snow gun in full view of that cam, even one of those small portable air water guns. No better look than seeing a gun firing live. No chance they took any notice of my ramblings. But really it is primary school marketing, this cam is their window to visitation, basic stuff. 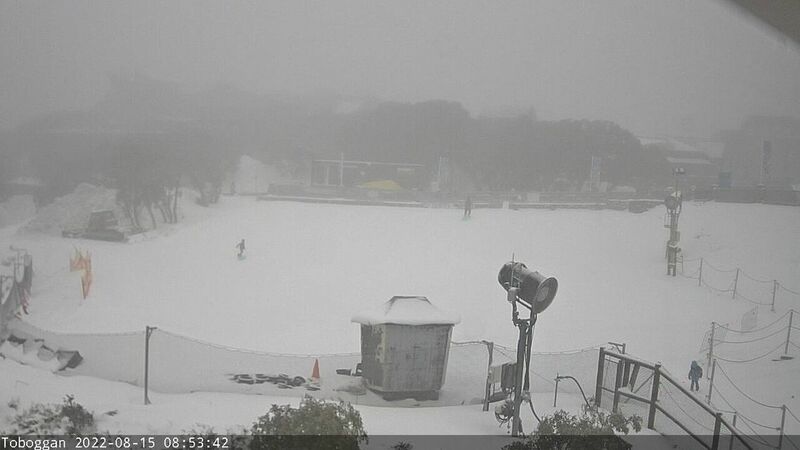 Case in point they have the car park cam updating into the darkness, where as the toboggan slope cam &quot;with&quot; the slurpie machine and now the fan gun is dead at around 3pm........... ? ? what the ? Yes you might see snow falling on the carpark but it is better to see &quot;snow falling&quot; on the &quot;snow base&quot; of the biggest draw card for day visitors, ie the toboggan slope. That adds up to that annoying term &quot;win win&quot; folks. You make an excellent point there Hunter I may suggest it to them. But I think you'd be surprised at the extent to which all resorts monitor the threads related to their respective resorts. You make snow where it needs to go. It's marketing's role to place cameras and publicise it. Getting snowmakers to make stuff in front of cams when priorities are elsewhere is pretty lazy marketing. Guns are moved around relative to wind direction, also the distance that the T40 from TechnoAlpin blows the snow the gun has to be in a position to maximise coverage of the area that we require the snow, so if we moved the gun into the view of the toboggan run camera, the snow would end up in the car park or in the trees. So if you do not see a snow gun in the view of the camera it does not mean that we are not making snow. The two T40's that we have are fully automated and will start up and shut down as needed. If you would like to call into the office and we can show you what we do with the snow making, how the resort makes snow at any temp, and the reasons for moving guns around as snow demand change on a daily bases. Thank you very much for that informed reply, just what is required / sought. I understand what you as a snowmaker is saying. Lets look at the bigger picture though. 4. We must do what ever it takes to shine that light. 5. The toboggan snow cam view is our number 1 light. - get a snow gun / get a small snow gun / get a second hand snow / steal a snow gun / get something ( does not have to be the big fan, I remember the little air / water guns they used to use at Corin and elsewhere, looked like lawn sprinklers on a stand and could be used at marginal temps ) to show we are making snow ( slug aside ) inside that 24/7 lit up window to all our wavering clients. For sure use the big fan elsewhere where needed, put it on the toboggan run where possible / wind / temp / cost / cord length / what ever dictates, but the end game must be to paint the best picture possible in the most important window to the world you have - the toboggan cam view. That aside very positive to to get an interaction from the source. Now they are not playing fair ! Cam image frozen from yesterdays view of the just moved into shot fan gun !!!! They're having trouble with the toboggan run cam and getting it published on line. When I say 'they', I mean the computer guy they use in Alexandra. This is at least the second year that it's been a debacle. Probably the 3rd or 4th year) I reckon they should sack him and get someone more competent. They can't afford this downtime on that cam. Quick, someone go wheel that snow maker out to the XC trails while it still cold enough! Wonder if they have ever considered installing a magic carpet to drag punters back up the main toboggan run ? Would be a big attraction and a great combination for their main market, ie first timers to the snow. They can experience snow and a simple ski lift/carpet. They're having trouble with the toboggan run cam and getting it published on line. They can't afford this downtime on that cam. This morning's video's a strange one. Get a feeling of vertigo watching it. Sad to see one of the smallest / marginal / vunerable resorts struggling to present even the most basic of marketing messages. The daily video is a great idea though. and get him to provide you some descent promotional footage!!!!! who needs snow cams with heli footage available??? ^ I like that idea, but only when theres snow on the xc trails. Two little white streaks might not look very impressive from the helicopter. using a different cam view now, dumped the dead one. Except that it's not an updating cam - hence why no date and time stamp. The shot remained the same all day yesterday once they put it up. They now only have one automatic cam - the car park. They used to have 3 of them before the fires. They use a guy (a very nice guy) in Alexandra for their DP needs. Apparently he can't fix the bug. Me thinks it's time to change to someone who can - after 4 years of this, it's just not good enough. The small marginal resorts are on a knife edge of viability every year I cannot fathom how they could get to July with their number one marketing tool ( the toboggan slope cam) working less than perfectly. Pre seaon meeting minutes : ok what are the non negotiables ? ps. hope you get a big dump soon ! Down that much in school holidays doesn't bode well. But... they could the improve the already brilliant job they've done into an amazingly brilliant job if they did a bit of snow making on at least one XC trail, e.g. Echo flat or muster trail therefore allowing them to get on with those husky tours, give the XC skiers and first timers a bit of trail to ski on when theres insufficient snow And..... When the lower trails get patchy or melt first (as it does now) and the top ones stay covered a while after snow falls theres no need to have to hike out in the mud to the upper trails! I hope LM see this and consider this idea, I'm sure it would make a lot of XC skiers very happy to not have to be on the look out constantly for low elevation snow bearing systems (well we still would, but not as much ). All this will be forgotten if it starts dumping on Friday and Saturday, as it should, if the weather charts are correct. Mmm yes if theres a big one (I reckon it has to too, we've had so much bad luck this season in comparison with other resorts), but I still reckon it will be a good idea to secure season long (XC) snow. there might not be enough demand for the XC trails to justify more expensive snowmaking equipment, who knows though we might need something to balance the effects of climate change in the years to come if things get bad. Did they have all the guns going last night? Doesn't look like it from the cams but it definately felt cold.